Leirhnjúkur area near Myvatn lake. Credit: Chiara Arrighi (distributed via imaggeo.egu.eu). Iceland, the land of ice and fire, is well known for its volcanicity. Most famously, it is home to Eyjafjallajökull: the volcano which caused wide spread mayhem across European airspace when it erupted in 2010. But not all the local volcanic activity is unwelcome. 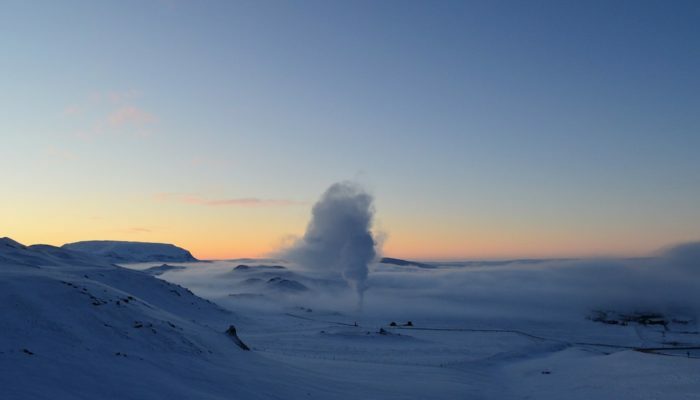 High temperature geothermal areas are a byproduct of the volcanic setting and the energy released can be used to power homes and infrastructure. Indeed, geothermal power facilities currently generate 25% of the country’s total electricity production. 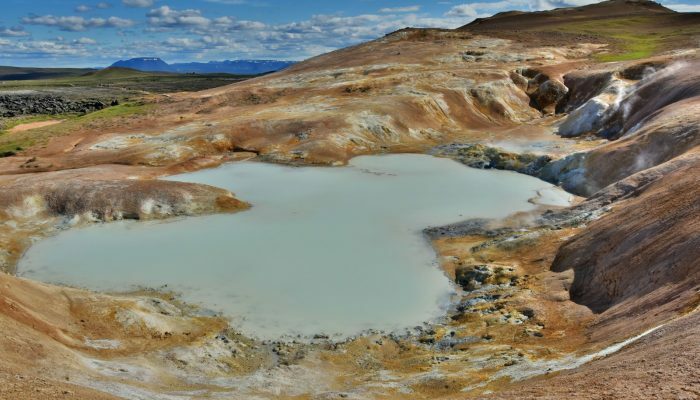 “I took the photograph during a three hour walk in the Krafla area, a few kilometres away from Myvatn Lake in Northern Iceland,” explains Chiara Arrighi, a PhD student at the University of Florence in Italy, who took today’s featured image while on a two week holiday on the island. There are 20 high-temperature areas containing steam fields with underground temperatures reaching 250°C within 1,000 m depth dotted across the country. 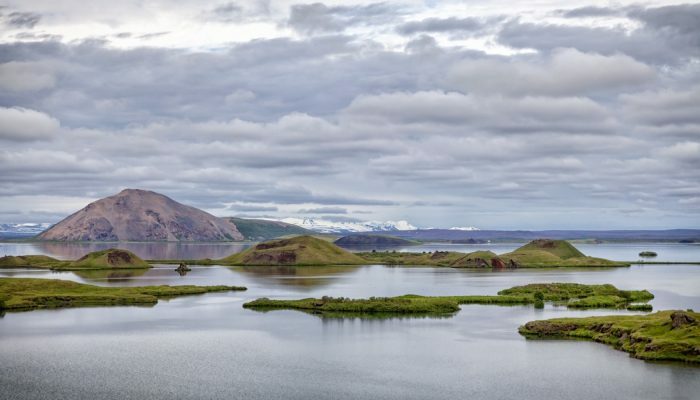 Krafla, a caldera of about 10 km in diameter, and the wider Myvatn area is one of them. The volcano has a long history of eruptions, which drives the intrusion of magma at (geologically) shallow depths which in turn heats groundwater trapped deep underground, generating the steam field. Only a few hundred meters from the shooting location a power station of 60 MW capacity exploits high- and low-pressure steam from 18 boreholes. Fumaroles and mud pots, like the one photographed by Chiara, are the surface expression of the geothermal activity. The discoloration of the rocks in the immediate vicinity of the bubbling mire is due to the acidic nature of the water in the pool. The steam is rich in hydrogen sulphide, which oxidises to sulphur and/or sulphuric acid as it mixes with oxygen when it reaches the surface. 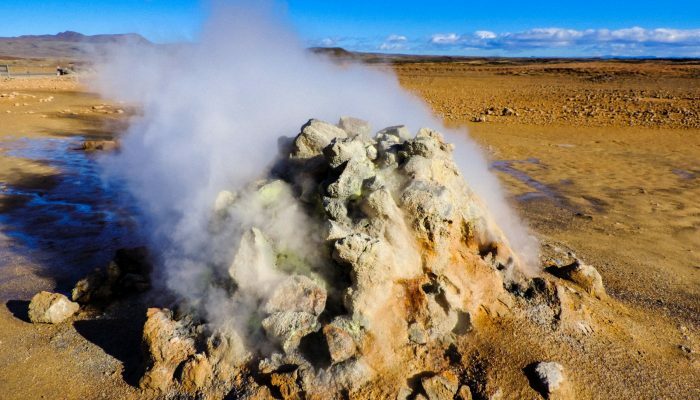 It deposits around the vents of fumaroles and as sulphuric acid in the stagnant waters, leading to alteration of the surrounding bedrock and soil.